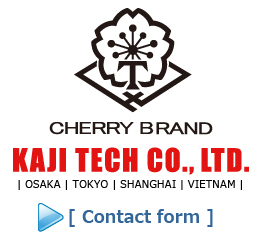 FAQ | KAJI TECH CO., LTD.
KAJI TECH CO., LTD. | This page summarizes the questions frequently asked. What finish do you have? Only matt finish available fort SUN GRIP and SBS. Matt and Shine finish for ST-70. What combination can we do? Is it possible to match all parts color? Yes, we can do DTM. Please provide us a fabric swatch. *There will be an additional dyeing fee. Excellent. High quality. We have data sheet. Please see this page. We always have stock in Standard colors. We can dispatch it within 2 weeks after receiving the order. We accept any requests. Please send us a fabric swatch. The fabric swatch should be larger than 30mm x 30mm. ⇒ Minimum of 10,000sets for the smallest order. What is sampling order quantity? Orders up to 2,000Sets/ are free （please cover postage). ⇒ on the premise that you’ll place bulk order later on. To fasten plastic snaps, proper diesmolds or machines are needed. We can lease or sell it. It takes 2 months to make a brand new machine. 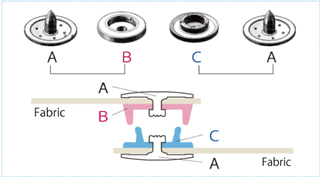 What types of fastening machines do you have? Diesmolds are needed to fasten snaps. 1 set is from 4 pieces diesmolds. Able to change diesmold with HAND, FOOT, SEM-AUTO. Unable to change with FULL-AUTO. Automatic type has to be set to the designated rails when assembling.